At Ridley the other day, I was leaving the dinning room when I came across a brochure that I just had to pick up! Here is a picture of the two big words on the front of the brochure that caught my attention! "Probe was a good way of refining my focus"
"I think the Probe is a fantastic way of introducing people to the work of Wycliffe." "Yes! 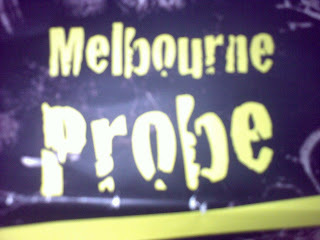 I want to come to the Melbourne Probe!" It's fair to say I was giggling on the inside as I read this, and to make sure I wasn't the only one who thought Melbourne Probe sounded like something a lot different to a bible translation course I showed it to some friends. There was much giggling. For the record, The Melbourne Probe is a short bible translation conference/course run by Wycliffe. Not something, that like riding a bike, will give you a sore bum... This is either a piece of marketing brilliance as I would not have looked at this brochure and read through it with such interest but for the name, or a little bit of naivety, or an example of my need for God to keep working on me!